We are very happy to announce the temporary closing of our studios during the holidays, as we will be attending a baby shower for Frostbite, the newest member of the Snowman family. Baby Frostbite softly landed upon the earth during an early season nor’easter in November. The heavy snowfall and warm temperature provided the perfect conditions for his delivery. Frostbite is doing very well. He’s gained a half-inch in diameter and already outgrown two top hats. His family says he’s very well behaved and describes his overall character as “chill”. We are very excited to share this joyous occasion with the Snowmans, for it was just a year ago when tragedy struck and we lost our beloved Frosty. His memory will last forever in our hearts and we’ll enjoy sharing with little Frostbite all the tales of his late great grandfather. 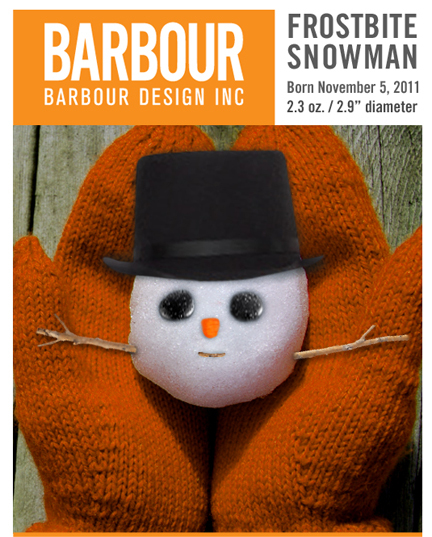 Barbour Design will reopen on Tuesday, January 3, 2012 upon our return from the Arctic.